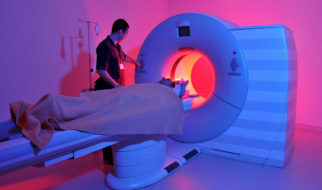 A CT-PET scan is used to find abnormal metabolic activity in the body. This procedure is most often used to look for and evaluate the spread of cancer. It also can be used to evaluate the brain for Alzheimer’s Disease and other kinds of dementia. The scan uses a small amount of radioactive dye that is injected through an IV line to make a 3D image of the body. The scan is painless. Radiology Consultants offer this service at Boone Hospital Center, Missouri Cancer Associates, and Fitzgibbon Hospital. You can wear the gown provided or your own clothes. Inform the radiologist if you are currently pregnant or breastfeeding. Also inform about any medicine, allergies, recent illness, or other medical conditions. You may be asked to fast before the procedure. The radiologist will go over the images from your CT-PET scan and pass the results to your doctor.